BlackBerry today launched its flagship device, the BackBerry KEYone Limited Edition Black in India at an event in New Delhi. The smartphone will be sold exclusively on Amazon India starting August 8. It is priced at Rs. 39,990 which I felt is a bit high for a company looking to make a comeback in India. 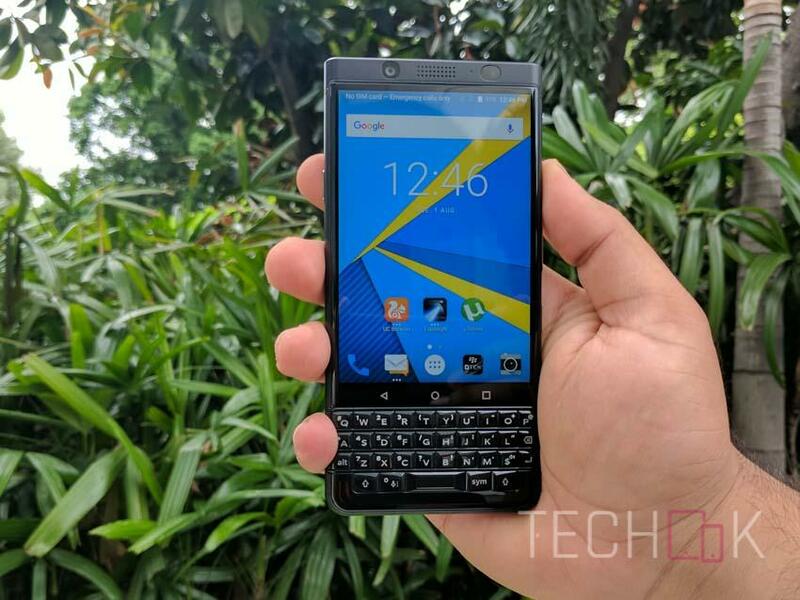 BlackBerry KEYone sold in India is an upgraded variant of the one that is sold worldwide, it BlackBerry’s first ever smartphone to come with a dual SIM card slot. It is also to be noted that the KEYone features the same chipset that can be seen in mid-range devices like the Xiaomi Redmi Note 4. However, the company has packed in other hardware features into the device which seem to make up for the price. At the launch event in New Delhi, we were able to spend some quality time with the device and here are our first impressions. Do keep in mind these are only our first impressions and not the final review which will come later. Holding the BlackBerry KEYone in our hands for the first time the first thing we noticed that the device is all black. The device is completely matte black colour whereas the camera ring on the back and the keyboard come in a glossy black colour. BlackBerry is calling this the KEYone Limited Edition Black. The device can be comfortably used with one hand and it also feels quite grippy due to the rubberised back. The KEYone was originally launched in February by TCL in the United States, and now it has made its way to India and is being manufactured by Optiemus. Which could mean that the quality complaints that were there with the KEYone manufactured by TCL are most likely fixed. The device as per our first impressions felt solid and of top quality. While the build of the phone was great it also looked the part of being a premium flagship smartphone. Interestingly, you can find the fingerprint sensor embedded into the space bar of the keyboard, which I felt is an amazing decision. BlackBerry has also embedded backlights in the spacebar which light up when the device is expecting a fingerprint. The inbuilt keyboard is good and brings back the feel which we got from the old BlackBerry devices, along with touch sensitivity which lets you navigate on the device. The BlackBerry KEYone features a 4.5-inch Full HD display along with curved gorilla glass 4 protection. It features an aspect ratio of 3:2 along with a resolution of 1620 x 1080 pixels at 434 PPI. BlackBerry says that a 4.5-inch display on the KEYone is big enough as the device will not need to utilise a virtual keyboard which would have taken up space. We used the device in direct sunlight and found it to be quite legible. However, while using the device indoors after we had used it for some time outdoors we had to adjust the brightness, the auto-brightness did not get the settings right. Maybe, that was a one-time thing as we only had the device for around half an hour. The BlackBerry KEYone Limited Edition Black is powered by the Qualcomm Snapdragon 625 Octa-Core 2.0GHz processor along with 4GB of RAM and 64GB of Internal Storage expandable up to 2TB via a microSD card. People might see the Snapdragon 625 SoC and think that this is the same processor that comes in mid-range smartphones. However, the optimisations done by the company and other hardware additions make the phone worth it. All of this is backed by a 3,505mAh battery which the company claims will be able to handle 26+ hours of continuous usage. The KEYone is powered by Google’s latest Android 7.1.1 Nougat operating system. The device will come with heavy customisations to make it more secure. It will also feature the company’s DTEK security software, BlackBerry Hub, BBM, and much more. The customisations made to the software are deeply integrated which makes the device highly secure. There are many customisations in the software but you won’t find much bloatware on the device. It also runs extremely smoothly and doesn’t lag while heavy multitasking. BlackBerry also said that the KEYone will come with full support of Google Play Store. BlackBerry has always been seen as a business and productivity company. Therefore, people tend to not focus on their cameras. The KEYone uses a 12-megapixel rear camera sensor designed by Sony with Phase Detection Autofocus and support for 4K video at 30 frames per second. The Sony IMX 378 sensor used inside the KEYone is the same one that is used by the Google Pixel. The camera performance was simply amazing and I loved the outputs that the device was able to provide. On the front, you get an 8-megapixel shooter. As per my first impressions of the BlackBerry KEYone, I felt that the device was amazing. However, I did think that BlackBerry could have priced the smartphone at a bit lower price point. We remain to see how the device performs in the real world situations which we will let you know in our full review which will come out soon.